The world's wealthiest writer says fans can write about Harry Potter -- just so long as they do it without pay. Note: I've written an update/response to this post at, "More on why Rowling is wrong on the Potter lexicon." In 2000, Steve Vander Ark, a middle-aged, middle-school librarian and ardent "Harry Potter" fan, created one of the brightest sites in the constellation of online Potter arcana, the Harry Potter Lexicon. The HPL, as it's known, is a comprehensive reference work covering all that happens in J.K. Rowling's series -- to quote its Wikipedia entry (everything related to Potter is on WP), the Lexicon lists "characters, places, creatures, spells, potions and magical devices," and it introduced one of the first timelines of all events that occur in the Harry Potter universe. In the past, Rowling has offered high praise for the HPL. "This is such a great site that I have been known to sneak into an Internet cafe while out writing and check a fact rather than go into a bookshop and buy a copy of Harry Potter (which is embarrassing)," she says on her site. She calls the HPL "a website for the dangerously obsessive; my natural home." You might suppose that given her appreciation of the online HPL, Rowling would have encouraged the book's publication and sale. But you'd be wrong. On Halloween, Rowling and Warner Bros., which produces the Potter movies, filed suit to stop Vander Ark and RDR from selling the book. Late last week, RDR agreed to halt publication of Vander Ark's Potter lexicon pending a federal judge's review. In her suit, Rowling, arguably the most well-remunerated writer in history, asserts complete and total control over the Harry Potter creative universe -- a stance that, if affirmed by the court, would strike a deep blow to the legions of fans who have added immeasurably to her work online. Her attorneys claim that Vander Ark's book will compete with Rowling's own planned Potter encyclopedia; the lexicon, they say, is thus nothing more than an attempt to "make millions of dollars off the back of Ms. Rowling's creativity." (See a PDF of the complaint here.). In a statement, Rowling added: "It is not reasonable, or legal, for anybody, fan or otherwise, to take an author's hard work, re-organize their characters and plots, and sell them for their own commercial gain. However much an individual claims to love somebody else's work, it does not become theirs to sell." Has J.K. Rowling ever been to a library? Seriously, I truly wonder. Because if she had, she might have seen many examples of exactly the sort of books she describes as "not reasonable." For instance, a list of the allusions in "Ulysses"; or a complete guide to all of the characters in William Faulkner's fiction; or a compilation and detailed analysis of Bob Dylan's lyrics; or a book containing the complete chronology of the events in David Foster Wallace's "Infinite Jest." Hey, J.K. -- can I call you J.K.? -- these are known as "reference books," and, like the HPL, they are not mere "reorganizations" of characters and plots. They are works of scholarship -- works derived from detailed study of an artist's creations, and intended to aid in research and appreciation of those creations. You might take a look at the fair use provisions of U.S. copyright law, which allow people to copy work for "purposes such as criticism, comment, news reporting, teaching ... scholarship, or research." In her suit and her statement, Rowling tries to draw a distinction between the online version of the HPL and the proposed book version. The online version is OK, she says, because it's freely available to anyone. The print version will make money and thus is not allowed. This seems an arbitrary distinction. For one thing, fair use covers both commercial and noncommercial works. Vander Ark points out that over the years many readers have asked him to publish a portable print version of his site -- it's hard to imagine how he could have done so in a non-commercial manner. Moreover, Vander Ark and others who work on the HPL have spent much time compiling it. Why shouldn't they be entitled to profit from their labor? Does Rowling expect all scholars who make reference works to take vows of poverty? Note that I am not saying that Rowling will lose the case. That question is up in the air. Some legal commentators note that her previous endorsement of the HPL Web site could cause trouble for her effort to stop the book. A judge might conceivably construe her praise for the HPL -- she even gave the site a "Fansite Award" -- as a waiver of her control over such works. On the other hand, two precedents argue in her favor. In Twin Peaks Productions, Inc. v. Publications International, Ltd., a court ruled against the publication of a book of plot summaries of the TV show "Twin Peaks." In Castle Rock Entertainment, Inc. v. Carol Publishing Group, Inc., a court ruled that "The Seinfeld Aptitude Test," a collection of trivia questions testing people's mastery over obscure details from the show, infringed upon the studio's copyrights of "Seinfeld" scripts. Those precedents have been criticized by other judges, however, and experts have questioned whether they'll stand up to further review. But the question is not whether Rowling is on solid legal ground in suing her fans. It's whether she's on solid moral ground. And the answer, obviously, is no; indeed, considering how much her fans have done for her, her move is even more lamentable than Prince's recent promise to sue his supporters. 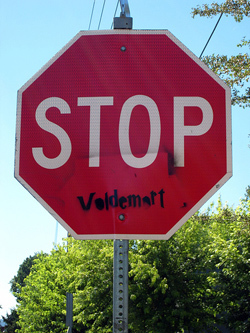 Rowling's success is due in no small part to the bustling online community of Potter adherents. The HPL -- like the many Potter community forums and the reams of fan fiction -- has added layers of meaning to Rowling's work. For some fans, indeed, Rowling's seven books represent just a small bit of the world of Harry Potter, not the main point of it. The main point of it, for them, is the culture of Potter -- the whirring world of Potter fandom that's sure to spin for decades, long after Rowling herself has passed on. How many hundreds of millions has this community sent Rowling's way? If there were no Internet, no online Harry Potter culture, how much poorer would she be right now? It's impossible to say. Yet surely she owes her fans something -- surely Rowling owes them at least the opportunity to make a living off their work on her behalf (especially as she won't lose a single dime in the process). The big news from the world of Harry Potter isn't that Dumbledore is gay. It's that J.K. Rowling is greedy.